Cuquis Robledo is a junior and Psychology major from Houston, TX. Last summer, she participated in DukeEngage Seattle working at a non-profit organization called Disability Rights Washington (DRW). 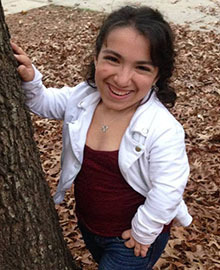 As someone who has a disability (Cuquis is a Little Person, specifically she has spondylo-epi-metaphyseal dysplasia (SEMD)), Cuquis felt she could relate to this advocacy work. While there, she worked on a video project about inaccessibility in Seattle related to the lack of curb cuts or inability to maintain curb cuts as well as wrote a series of blogs about the importance of Disability Education. Cuquis will return to DRW to continue working on educational videos for people to learn about the importance of rights for people with disabilities and hopefully find a reason as to why after 25 years since the signing of the American with Disabilities Act, not enough progress has been made in terms of equal opportunities for people with disabilities.